With love from the stuffies, all finished. 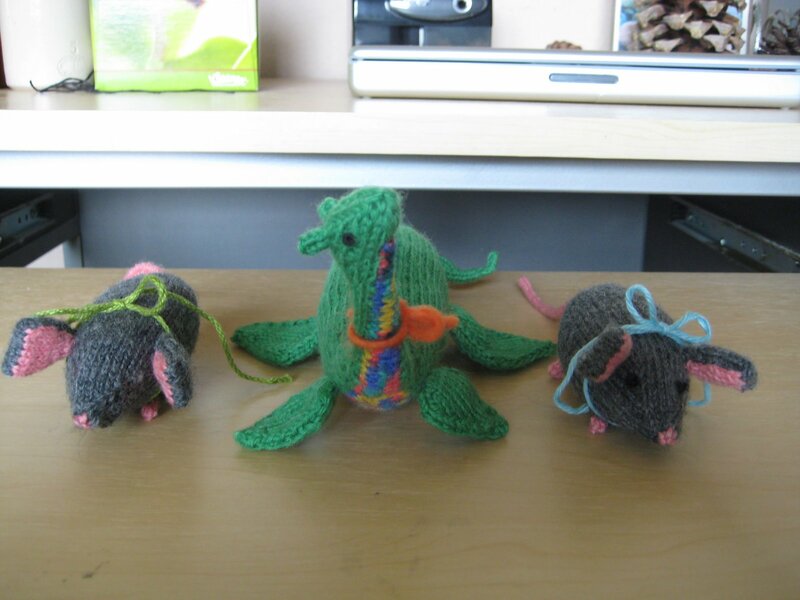 Ok–all finished as of 8 this morning, when I did eyes for the Mousie on the left. Nessie used some discontinued acrylics from the depths of my stash, and Mousie is Crystal Palace Panda Wool leftover from Mum’s Christmas socks and a modicum of my endless stash of Dalegarn. Both are fabulous patterns, and happily received. We always got little stuffed creatures in our baskets when we were little, and there are just too many adorable stuffie patterns out there *not* to continue the tradition. Here’s hoping everyone’s having a restful Sunday, complete with jellybeans and knitting!